Jenny's older brothers are very interested in telecommunications. Their uncle, who shares their fascination, regularly brings them radios, speakers, microphones, television screens, and other equipment so that they can experiment with new technology and maybe even come up with ways to make their lives easier. As her brothers find ways to revolutionize everything from schoolwork to waking the household up in the morning, Jenny finds that she has developed an even more efficient way to receive messages from those around her. Jenny's ear is able to hear what people are thinking. When her brothers learn of this exciting new ability, they immediately look for ways to use it to make money, taking their sister to the local spelling bee, and later, to nationally televised quiz shows, where she can't be beat - at least, not until her unique ability begins to fade away. As he did in The Enormous Egg, here Oliver Butterworth tells a fantastical story that almost feels plausible. In many fantasy novels, characters who develop strange abilities panic about them and go to great lengths to keep them a secret. In this book, though, Jenny's family learns of her newfound sensitive hearing and begin to fold this new information into their lives as though it is no big deal. They do keep it a secret from the quiz show hosts and such, at least at first, but the book is less about hiding a magic power and more about exploring the ethical and practical implications of being able to spy on the thoughts of others without even really trying. 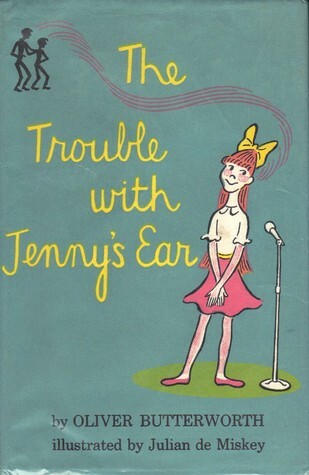 The Trouble with Jenny's Ear is a light, humorous story which explores serious subjects in a whimsical way. The focus on quiz shows and the novelty of television and other electronics decidedly dates the book to the '50s or '60s, but that just makes it more charming and fun to read. This would be a fun family read-aloud, even for kids as young as 5 or 6, and a good independent read for ages 8 and up.